Habit: Annual, +- perennial herb. Stem: spreading, 3--40 cm. Leaf: 3--30 mm. Inflorescence: flowers 1--8. Flower: sepals 2.5--5 mm, green or +- red; petals 3--5 mm, yellow; stamens 5--12; style branches 3--6. Fruit: 2--4.5 mm wide. Seed: 0.6--1 mm wide, dark brown to black. Chromosomes: 2n=18,36,54. Synonyms: Portulaca granulato-stellulata (Poelln.) Ricceri & Arrigoni; Portulaca nitida (Danin & H.G. Baker) Ricceri & Arrigoni; Portulaca oleracea subsp. granulato-stellulata (Poelln.) Danin & H.G. Baker; Portulaca oleracea subsp. nitida Danin & H.G. Baker; Portulaca oleracea subsp. oleracea; Portulaca oleracea subsp. papillato-stellulata Danin & H.G. Baker; Portulaca papillato-stellulata (Danin & H.G. Baker) Danin; Portulaca retusa Engelm. Unabridged Note: Evidence indicates that Portulaca oleracea is not monophyletic. 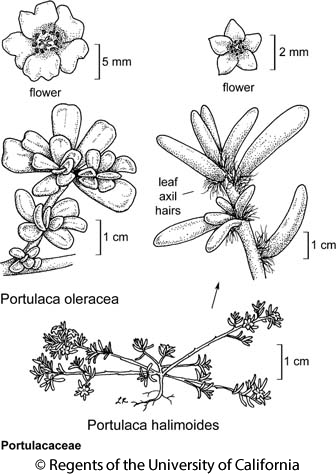 Some specimens found in DMoj seem to belong to either Portulaca oleracea subsp. impolita Danin & H.G. Baker or to a lineage more close related to Portulaca johnstonii Henrickson; study needed. Citation for this treatment: Gilberto Ocampo 2012, Portulaca oleracea, in Jepson Flora Project (eds.) Jepson eFlora, http://ucjeps.berkeley.edu/eflora/eflora_display.php?tid=39530, accessed on April 22, 2019.